Human β-defensin (hBD)-2, a cationic antimicrobial peptide primarily induced in epithelial cells in response to inflammatory stimuli, plays an important role in host defense. To elucidate the expression mechanism of hBD-2 in the lung, we investigated the modulation of hBD-2 transcription in pulmonary epithelial cells by mononuclear phagocytes stimulated with LPS. Coculture of A549 pulmonary epithelial cells with Mono-Mac-6 monocytic cells in the presence of Escherichia coli LPS markedly up-regulated hBD-2 promoter activity, whereas A549 alone did not respond to LPS to activate the hBD-2 promoter. Furthermore, IL-1β and TNF-α in the culture supernatants from LPS-stimulated monocytic cells activated the hBD-2 promoter in A549 cells. Of note, IL-1β was more potent than TNF-α in this effect. In addition, a mutation of the NF-κB site at −200 (pκB1 site) completely abolished this IL-1β- and TNF-α-induced hBD-2 promoter activation, whereas NF-κB inhibitors (MG-132 and helenalin) strongly suppressed it. Moreover, electrophoretic mobility shift assay suggested that NF-κB, consisting of p65-p50 heterodimer, could bind to the pκB1 site in cytokine-stimulated A549 cells. Interestingly, flow cytometric analysis revealed that A549 cells expressed CD14 but lacked Toll-like receptor 4, which may account for the hyporesponsiveness of A549 cells to LPS. Taken together, these results suggest that hBD-2 expression in pulmonary epithelial cells is modulated by NF-κB via the actions of IL-1β and TNF-α produced by LPS-stimulated mononuclear phagocytes. Pulmonary epithelial cells and macrophages are in direct contact with the ambient environment. The early recognition by these cells of inhaled pathogens and their products is critical to the innate immune system, the first line of host defense against invading microorganisms. These cells recognize bacteria and their products, and kill bacteria by producing antibacterial molecules (1, 2, 3). Pulmonary epithelial cells and macrophages also generate various immune effectors such as cytokines, chemokines, and antimicrobial peptides in response to inflammatory stimuli, and regulate the activation and recruitment of professional phagocytes (neutrophils and macrophages) and immune cells (T cells and dendritic cells) (3, 4, 5, 6). Among the antimicrobial peptides, human β-defensins (hBDs)3 play a unique role linking innate and acquired immunities (3, 7, 8). The defensin family of antimicrobial peptides is widely distributed among various species from plants to mammals, and exhibits a broad spectrum of microbicidal activities against bacteria, fungi, and viruses (9, 10). Mammalian defensins are divided into three subfamilies: α- and β-defensins differ in the placement and connectivity of their six conserved cysteine residues, while the third, θ-defensin, isolated from macaque leukocytes, exhibits a unique circular structure (11, 12). In humans, the α-defensins are mainly expressed in neutrophils (human neutrophil peptides 1–4) and intestinal Paneth epithelial cells (human defensins 5 and 6) (9, 10). In contrast, hBDs, four of which (hBD-1 to -4) have been identified and characterized to date, are largely expressed in various epithelial tissues, including lung and skin (7, 13, 14, 15, 16, 17, 18, 19, 20). Interestingly, hBD-2 to -4 are highly inducible, whereas expression of hBD-1 is constitutive (7, 11, 19). In this context, hBD-2 peptide, initially purified from psoriatic scales, is detected in airway surface fluid from patients with infectious lung diseases but not normal volunteers (21, 22). Likewise, mRNAs for hBD-3 and -4 are up-regulated upon bacterial exposure in lung epithelial cells (17, 18, 19). Thus, hBD-2 to -4 likely play a crucial role in host defense against bacterial infection as inducible components in the epithelial barrier (7, 10). In addition, hBD-1 to -3 possess chemotactic activities for immature dendritic cells and memory T cells, while hBD-3 and -4 elicit monocyte chemotaxis (16, 17, 18, 19, 23). These characteristics suggest that hBDs may also contribute to adaptive immunity through the induction of immune cell migration (8, 10). Moreover, we recently revealed that hBD-2 activates mast cells to induce chemotaxis, histamine release and PGD2 production, suggesting the involvement of hBD-2 in allergic reactions (24, 25). Given the intriguing functionality of hBDs, it is important to elucidate the molecular mechanisms regulating their expression. To date, the expression of inducible hBDs has been reported to be modulated by both microbial products and cytokines (3, 7). In current thinking, it is accepted that the recognition of bacterial components, as well as signal transduction in this process, are achieved through pattern recognition receptors (PRRs) such as Toll-like receptors (TLRs) and CD14. In this regard, mononuclear phagocytes, which abundantly express PRRs, can respond to low doses of bacteria-derived components (26, 27, 28, 29). In contrast, pulmonary epithelial cells require high doses of bacterial components for cell activation, despite the expression of TLR1 to -6 and CD14 mRNAs (3, 7, 30, 31, 32). Interestingly, pulmonary epithelial cells readily respond to cytokines and are triggered at a lower threshold (3, 4, 7). Because monocytes/macrophages are highly sensitive to bacterial stimuli and function as a principal source of proinflammatory cytokines, we considered that they may play a role in the induction of hBDs in lung epithelial cells. However, little information is available regarding the effect of mononuclear phagocyte-epithelial cell interactions on the regulation of hBD expression in epithelial cells. In the present study, we focused on the inducible expression of hBD-2, a well-characterized hBD, by investigating the transcriptional regulation of hBD-2 in lung epithelial cells by mononuclear phagocytes following LPS stimulation, using A549 pulmonary epithelial cells and monocytic Mono-Mac-6 (MM6) and U937 cells. Results showed that proinflammatory cytokines (IL-1β and TNF-α) produced from LPS-stimulated mononuclear cells up-regulated the expression of endogenous hBD-2 mRNA and also the hBD-2 promoter activity analyzed by luciferase reporter constructs in A549 cells. Further, this cytokine-mediated hBD-2 promoter activation in A549 cells required binding of NF-κB p65-p50 heterodimer to a proximal NF-κB element at −200 in the hBD-2 promoter. Finally, evaluation of the surface expression of PRRs revealed that CD14 was expressed but that TLR4 was hardly expressed on A549 cells. LPS from Escherichia coli O55:B5 and O111:B4 were obtained from Sigma-Aldrich (St. Louis, MO). Biotinylation of E. coli LPS (O111:B4) was described before (33). A specific inhibitor of the NF-κB p65 subunit, helenalin (4-hydroxy-5,8-dimethyl-3-methylene-3a,4a,5,8,9,9a-hesahydro-3H,4H-azuleno(6,5-b)furan-2,6-dione) was obtained from Biomol Research Laboratories (Plymouth Meeting, PA) (34). The proteasome inhibitor MG-132 was purchased from Calbiochem (San Diego, CA). Helenalin and MG-132 were dissolved in DMSO and further diluted in PBS to ensure a DMSO concentration not exceeding 0.1%. Human recombinant TNF-α, IL-1β, and IFN-γ were obtained from PeproTech (Rocky Hill, NJ). Chinese hamster ovary cell-derived recombinant human IL-6 was from Genzyme (Cambridge, MA). Neutralizing mAb against human TNF-α (clone 1825.121) or IL-1β (clone 8516.311), and goat anti-human IL-1β polyclonal Ab were purchased from Genzyme-Techne (Minneapolis, MN). Anti-human CD14 mAb (clone MY4) was obtained from Beckman Coulter (Tokyo, Japan), and clone 61D3 was from eBioscience (San Diego, CA). Anti-human TLR4 mAb (clone HTA125) was obtained from MBL (Nagoya, Japan). Anti-human TNF-α mAbs (clones mAb1 and mAb11), anti-human CD14 mAb (clone LeuM3), and anti-human CD11b mAb (clone 44) were obtained from BD PharMingen (San Diego, CA). Anti-human TLR2 mAb (clone TL2.1) was the kind gift of Genentech (South San Francisco, CA). Rabbit polyclonal Abs against NF-κB p65 (sc-109X) and NF-κB p50 (sc-114X) were obtained from Santa Cruz Biotechnology (Santa Cruz, CA). Mouse purified-IgG was from Sigma-Aldrich, IgG1 was from Beckman Coulter, and IgG2a and IgG2b were from eBioscience. Streptavidin-conjugated Alexa Fluor 594 was from Molecular Probes (Eugene, OR), streptavidin-conjugated PE was from eBioscience, and streptavidin-conjugated HRP was from Zymed Laboratories (South San Francisco, CA). The human lung alveolar type II epithelial cell line A549 and human monocytic cell line U937 (CCL-185 and CCL-1593.2, respectively) were obtained from the American Type Culture Collection (Manassas, VA). A549 cells were maintained in F12K (Invitrogen, Carlsbad, CA) supplemented with 10% FCS (Sanko Junyaku, Tokyo, Japan), 100 U/ml penicillin, and 0.1 mg/ml streptomycin (Sigma-Aldrich) at 37°C in 5% CO2. FCS contained <5 pg/100 ml LPS as certified by the manufacturer. U937 cells were cultured in RPMI 1640 (Sigma-Aldrich) with 10% FCS, 100 U/ml penicillin, and 0.1 mg/ml streptomycin. For monocytic differentiation, U937 cells were cultured in the presence of 10 nM PMA for 2 days, and adherent cells were used as PMA-differentiated U937. Differentiation of cells was confirmed by the expression of CD11b and CD14 analyzed using flow cytometry. The human monocytic cell line MM6 was purchased from German Collection of Microorganisms and Cell Cultures (Braunschweig, Germany) and cultured in RPMI 1640 supplemented with 10% FCS, 1× nonessential amino acids (Invitrogen), 1 mM sodium pyruvate (Invitrogen), 9 μg/ml bovine insulin (Sigma-Aldrich), 100 U/ml penicillin, and 0.1 mg/ml streptomycin. Human PBMC from healthy donors were obtained by density gradient centrifugation with Lymphoprep (Nycomed, Oslo, Norway). PBMC were allowed to adhere to plastic culture plates. After removal of nonadherent cells, adherent monocytes were collected and plated at 2 × 105 cells/ml in RPMI 1640 containing 10% human AB serum. The purity of monocytes/macrophages (>90%) was confirmed by flow cytometry as CD14- and CD64-positive cells. The cells were then cultured for 7 days to differentiate to macrophages. For preparation of culture supernatants from monocyte-derived macrophages (MDMφ) and monocytic cell lines (MM6 and U937), cells (2 × 105 cells/ml) were incubated with or without 1 μg/ml E. coli LPS for 16 h at 37°C. Likewise, confluent A549 cells (1 × 106 cells/35 mm plate) were incubated in the presence or absence of 10 μg/ml E. coli LPS or TNF-α (2, 10, and 20 ng/ml) for 16 h. Culture supernatants were collected and stored at −80°C. They were used for stimulation of epithelial cells and measurement of cytokines without dilution. A 2.3-kbp fragment of human hBD-2 promoter (−2274 to +50) was amplified from PstI-digested genomic DNA by PCR using specific primers designed based on a published sequence (35), and subcloned into the promoterless firefly luciferase vector pGL3-Basic (Promega, Madison, WI) to generate hBD 2/Luc plasmid. A series of 5′ deletion fragments were prepared by digestion with appropriate restriction enzymes or by PCR using appropriate primers as described previously (36), and the constructs were named Δ−2187/Luc, Δ−1050/Luc, Δ−577/Luc, Δ−412/Luc, Δ−188/Luc, Δ−167/Luc, and Δ−106/Luc, respectively (Fig. 5⇓B). For generation of mutated NF-κB constructs, individual NF-κB sequences in the hBD-2 promoter, dκB (−2193 to −2182), pκB2 (−596 to −572), and pκB1 (−205 to −186), were mutagenized by PCR using the hBD 2/Luc and mutant NF-κB primers, and the hBD-2 promoters containing mutated NF-κB sequences were introduced to the pGL3 vector plasmid as described previously (Ref. 36 and Table II⇓). The resulting mutated NF-κB constructs were termed dκBmut/Luc, pκB2mut/Luc, pκB1mut/Luc, and pκB1+2mut/Luc (mutations with both the pκB1 and pκB2 sites) (Fig. 5⇓C). A549 cells (5 × 105 cells/plate) were seeded into 35-mm plates 1 day before transfection. Cells were transfected with 1.5 μg of firefly luciferase expression construct containing wild-type or mutated hBD-2 promoter and 50 ng of Renilla luciferase expression vector pRL-SV40 (Promega) using FuGENE 6 (Roche Diagnostics, Indianapolis, IN) according to the manufacturer’s protocol. Following transfection, cells were cultured for 19 h, then stimulated for 5 h with various stimuli as follows: E. coli LPS, cytokines (TNF-α, IL-1β, IL-6, and IFN-γ), and monocytic cell-derived culture supernatants. In some experiments, cells were treated for 30 min before stimulation with neutralizing Abs against TNF-α and IL-1β, or NF-κB inhibitors (helenalin and MG-132). For coculture experiments, confluent A549 monolayers in 35-mm plates (1 × 106 cells) were transfected, incubated for 8 h, and cocultured with 1 × 105 MM6 cells in RPMI 1640 containing 10% FCS in the presence or absence of 1 μg/ml LPS for 16 h.
After stimulation, cells were harvested and lysed in 200 μl of PicaGene Dual Cell Culture Lysis reagent (Toyo Ink, Tokyo, Japan). Firefly and Renilla luciferase activities were measured using a PicaGene Dual SeaPansy Luminescence kit (Toyo Ink) and Lumat LB9501 luminometer (Berthold, Tokyo, Japan). Protein concentrations of cell extracts were determined with a BCA protein assay kit (Pierce, Rockford, IL). Promoter activities are expressed as relative light units, normalized to Renilla luciferase activity. Confluent A549 cells (1 × 106 cells/35-mm plate) were incubated with or without E. coli LPS, cytokines (TNF-α, IL-1β, IL-6, and IFN-γ), or monocytic cell-derived supernatants for 16 h. Total RNA was then purified using an RNeasy mini kit (Qiagen, Valencia, CA) and treated with RNase-free DNase set (Qiagen) to remove contaminated DNA according to the manufacturer’s protocols. RT-PCR was performed using a ReverTra Dash RT-PCR kit (Toyobo, Osaka, Japan). In brief, cDNA was synthesized by reverse transcription of DNase-treated total RNA (1 μg) using ReverTra Ace reverse transcriptase and random primers. PCR amplification was performed with KOD dash Taq polymerase in a Thermal Cycler (PerkinElmer/Cetus, Norwalk, CT) for 35 cycles (for hBD-2 and CD14) or 28 cycles (for G3PDH) of 10 s at 98°C, 10 s at 60°C, and 30 s at 74°C. To discriminate mRNA-derived PCR products from genomic DNA-derived products, the following intron-spanning PCR primers were used: hBD-2, 5′-CCAGCCATCAGCCATGAGGGT-3′ and 5′-GGAGCCATCAGCCATGAGGGT-3′)(15); hCD14, 5′-ACTTATCGACCATGGAGC-3′ and 5′-AGGCATGGTGCCGGTTA-3′ (37); and G3PDH, 5′-ACCACAGTCCATGCCATCAC-3′ and 5′-TCCACCACCCTGTTGCTGTA-3′ (Toyobo). All PCR products were resolved by 2% agarose gel electrophoresis. TNF-α and IL-1β in culture supernatants collected from LPS-treated A549 cells and monocytic cells (MM6 and PMA-differentiated U937 cells) were quantified by a sandwich ELISA technique. Likewise, IL-1β production from TNF-α-stimulated A549 cells was measured by ELISA. Microtiter plates (Corning, Acton, MA) were coated with mAb to human TNF-α (mAb1) or IL-1β (8516.311) overnight at 4°C. Plates were blocked with BlockAce (Dainippon Pharmaceutical, Tokyo, Japan), and culture supernatants were added into the wells and incubated for 2 h at room temperature. After washing with PBS containing 0.05% Tween 20, TNF-α or IL-1β was detected by development with a combination of biotinylated Ab (anti-TNF-α mAb11 mAb or anti-IL-1β polyclonal Ab) and streptavidin-conjugated HRP. The detection limits of these ELISAs were 15 pg/ml for IL-1β and 31 pg/ml for TNF-α. A549 and PMA-differentiated U937 cells were detached with PBS containing 0.05% EDTA. These detached cells or MM6 cells (5 × 105 cells) were blocked with normal mouse serum, then incubated with FITC-, PE-, or biotin-conjugated mouse mAbs against TLR2, TLR4, or CD14, or isotype control (IgG1, IgG2a, or IgG2b) for 30 min at 4°C. For detection of biotin-labeled primary Ab, cells were further incubated with streptavidin-conjugated Alexa Fluor 594 for 15 min at 4°C. Cells were washed twice with PBS containing 1% BSA and 0.01% NaN3, and analyzed with a FACSVantage (BD Biosciences, San Jose, CA). For detection of CD14 molecules, we used three kinds of anti-CD14 mAbs (MY4, LeuM3, and 61D3). These mAbs recognize different epitopes of CD14 molecules. MY4 binds to a functional domain of membrane CD14, and blocks the binding of LPS to CD14. In contrast, 61D3 does not inhibit the binding of LPS to CD14. Likewise, LeuM3 hardly blocks LPS binding (38, 39, 40). LPS binding to A549 cells was determined by flow cytometric technique (33). A549 cells (2 × 105 cells) were incubated with 100 ng/ml biotinylated E. coli LPS in the presence of 10% FCS for 15 min at 37°C, with gentle agitation. For blocking experiments, cells were treated with 2.5 μg of neutralizing anti-CD14 mAb (MY4) or control mouse IgG for 15 min at 37°C before addition of LPS. Subsequently, cells were incubated with streptavidin-conjugated PE for 30 min at 4°C. Cells were washed twice with PBS and analyzed with a FACSVantage. A549 cells (108 cells) were incubated for 2 h with or without 1 ng/ml IL-1β, 10 ng/ml TNF-α, or monocytic cell-derived culture supernatants at 37°C, and nuclear extracts were prepared from stimulated or resting cells as described previously (36, 41). In brief, A549 monolayers were washed twice with PBS and harvested using a rubber policeman. Cells were lysed in lysis buffer (10 mM HEPES (pH 7.9), 10 mM KCl, 0.2 mM EDTA, 1.5 mM MgCl2, 0.5% Nonidet P-40, 1 mM DTT, 1 mM PMSF, 10 μg/ml leupeptin, and 10 μg/ml pepstatin) on ice for 10 min. Nuclei were washed in the same buffer except for Nonidet P-40, pelleted, and resuspended in extraction buffer (10 mM HEPES (pH 7.9), 420 mM NaCl, 0.2 mM EDTA, 1.5 mM MgCl2, 25% glycerol, 1 mM DTT, 1 mM PMSF, 10 μg/ml leupeptin, and 10 μg/ml pepstatin). After incubation at 4°C for 20 min with gentle rocking, the nuclei were removed by centrifugation at 12,000 × g for 20 min at 4°C. The resultant supernatants were collected and stored at −80°C until used for gel EMSA. Protein concentrations in nuclear extracts were measured with a BCA protein assay kit. Nuclear extracts (4 μg) were mixed with [32P]DNA probe (7 × 104 cpm) in 15 μl of a binding buffer containing 20 mM HEPES (pH 7.9), 100 mM NaCl, 1 mM EDTA, 6% glycerol, 1 mM DTT, 1 mM PMSF, 0.25 mg/ml BSA, and 2 μg of poly(dI-dC)·poly(dI-dC) (Amersham Biosciences, Piscataway, NJ) for 20 min at room temperature. The reaction mixtures were applied to a native 6% polyacrylamide gel in 0.25× TBE (22.3 mM Tris, 22.3 mM boric acid, and 0.5 mM EDTA (pH 8.3)) at 130 V for 70 min at 4°C. The gels were dried and exposed to Fuji RX-U x-ray film (Fuji Photo Film, Tokyo, Japan) at −80°C. For competition assay, a 25-fold molar excess of unlabeled oligonucleotide was incubated with nuclear extracts in the reaction mixture for 15 min at room temperature before addition of the probe. For supershift experiments, 1 μg of polyclonal Abs against NF-κB p65 (sc-109X), NF-κB p50 (sc-114X), or normal rabbit IgG was added to the reaction mixture 20 min before incubation with the probe. Synthetic oligonucleotides were designed to generate a single 5′-G overhang at each end after annealing with their complementary oligonucleotides. Oligonucleotide for the hBD-2 pκB1 site corresponds to the sequence from −208 to −183 in the promoter (pκB1 oligo, 5′-GGAAGGGATTTTCTGGGGTTCCTGAC-3′). NF-κB and NF-IL-6 (C/EBP) consensus oligonucleotides (κB oligo, 5′-GGTTGAGGGGACTTTCCCAGGC-3′, and EBP oligo, 5′-GTGCAGATTGCGCAATCTGCAC-3′, respectively) were synthesized based on the sequences of TransCruz Gel Shift Oligonucleotides (Santa Cruz Biotechnology). The double-stranded pκB1 oligonucleotides were labeled by filling in the cohesive ends with [α-32P]dCTP (ICN Biomedicals, Costa Mesa, CA) and a Klenow fragment (New England Biolabs, Beverly, MA) and used as a probe. The data were expressed as the mean ± SD, and analyzed for significant difference by a one-way ANOVA and a post-hoc test using the StatView program (SAS Institute, Cary, NC). Differences were considered statistically significant if p < 0.05. Inflammatory stimuli such as LPS and proinflammatory cytokines have been reported to induce the expression of hBD-2 in A549 alveolar type II epithelial cells at mRNA and peptide levels (42). However, in our experiments, hBD-2 promoter activity was not induced in A549 cells by even high doses of E. coli LPS (up to 100 μg/ml) (Fig. 1⇓A). Furthermore, 250 U/ml IFN-γ, which activates lung epithelial cells (43), did not induce activation of the hBD-2 promoter (Fig. 1⇓A). Likewise, this promoter was not activated by coincubation with 250 U/ml IFN-γ and 10 μg/ml LPS (data not shown). In the lungs, mononuclear phagocytes such as alveolar macrophages respond to bacteria and their products, and activate epithelial cells by producing various cytokines and chemokines (1, 3, 44, 45). Therefore, we tested whether the coculture of A549 cells with the MM6 monocytic cell line affects hBD-2 promoter activity following LPS stimulation. In preliminary experiments, we confirmed that MM6 cells express membrane CD14 (46) and TLR4 (data not shown), and are highly sensitive to LPS, as previously reported (46). Interestingly, hBD-2 promoter activation was remarkably induced in A549 cells by coculture with MM6 cells in the presence of LPS (Fig. 1⇓B). The addition of IFN-γ, which synergistically activates monocytes/macrophages with LPS (47), further increased LPS-induced hBD-2 promoter activity (Fig. 1⇓B), although IFN-γ alone did not induce activation above the resting level (data not shown). These results suggest that LPS-stimulated MM6 cells may activate hBD-2 promoter in A549 cells by producing some bioactive effector(s) for the epithelial cells. Induction of hBD-2 promoter activity in A549 cells by coculture with LPS-treated monocytic cells. A549 cells were transfected with luciferase-expression plasmid containing hBD-2 promoter (hBD 2/Luc), and incubated with E. coli LPS, human IFN-γ, or both for 5 h (A), or cocultured with MM6 in the presence or absence of E. coli LPS, IFN-γ, or both for 16 h (B). Luciferase activities are expressed as fold activation relative to the unstimulated control (Resting). Values are mean ± SD of five to seven independent experiments. Values were compared between control (Resting) and stimulated cells. ∗, p < 0.0001. To identify more closely the monocytic cell-derived soluble mediators that activate the hBD-2 promoter in A549 cells, we examined the effect of culture supernatants from PMA-differentiated U937 and MM6 cells on hBD-2 promoter activation. As shown in Fig. 2⇓, supernatants from LPS-treated monocytic cells (PMA-differentiated U937 and MM6 cells) markedly up-regulated hBD-2 promoter activity in A549 cells, whereas those from unstimulated cells (resting cells) did not. Effect of neutralizing Abs on hBD-2 promoter activation induced by monocytic cell-derived culture supernatants. A549 cells were transfected with the hBD 2/Luc plasmid and incubated with the culture supernatants from monocytic cells (PMA-differentiated U937 (A) and MM6 (B)) for 5 h. For neutralization assay, the supernatants were pretreated with neutralizing mAb (anti-IL-1β mAb, anti-TNF-α mAb, or both) or mouse IgG for 30 min before addition to A549 cells. Luciferase activities are expressed as fold activation in cells treated with LPS-stimulated monocytic cell-derived supernatants relative to those treated with unstimulated monocytic cell-derived supernatants (Resting). Values are mean ± SD of five to seven independent experiments. Values were compared between LPS-stimulated cell supernatants without and with mAbs. ∗, p < 0.0001. Furthermore, we examined whether the promoter assay using the luciferase reporter gene is relevant to the expression of endogenous hBD-2 mRNA in A549 cells. Consistent with the results of luciferase analysis, hBD-2 mRNA in A549 cells was significantly increased by treatment with the supernatants from LPS-stimulated MDMφ and monocytic cells, but not LPS alone, IFN-γ alone, or the supernatants from unstimulated cells (Fig. 3⇓). These results suggest that luciferase assay is reflecting the expression of hBD-2 mRNA, possibly the transcription of the hBD-2 gene. Effect of monocytic cell-derived culture supernatants on the expression of endogenous hBD-2 mRNA in A549 cells. 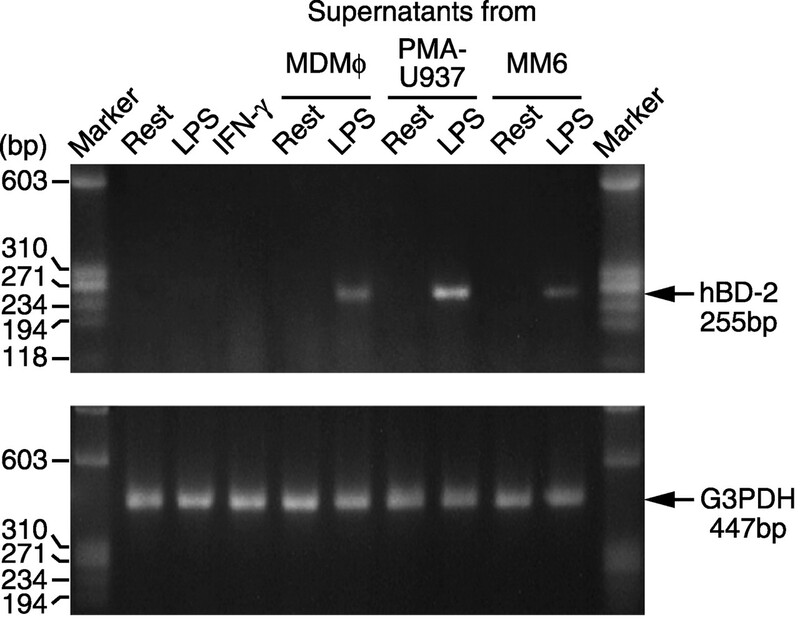 MDMφ, PMA-differentiated U937 (PMA-U937), and MM6 were treated with or without E. coli LPS (100 ng/ml for MDMφ, 1 μg/ml for U937 and MM6) for 16 h, and culture supernatants were collected. A549 cells were exposed to the supernatants, 10 μg/ml LPS, or 250 U/ml IFN-γ for 16 h, and subjected to RNA isolation as described in Materials and Methods. hBD-2 (255 bp)- and G3PDH (447 bp)-specific RT-PCR products were amplified using their intron-spanning primer pairs and total RNA from A549 cells. Among biological mediators released from LPS-stimulated monocytes/macrophages, IL-1β and TNF-α are known as pivotal inflammatory inducers that act on many cell types, including pulmonary epithelial cells (4, 43, 48). Thus, to define the contribution of IL-1β and TNF-α to hBD-2 promoter activation by culture supernatants from LPS-treated monocytic cells, we assessed the effect of neutralizing mAbs against these cytokines on the hBD-2 promoter activity in A549 cells. Interestingly, neutralizing anti-IL-1β or anti-TNF-α mAb suppressed hBD-2 promoter activity in A549 cells induced by PMA-differentiated U937-derived supernatants, by 90% or only 50%, respectively. Addition of both Abs further reduced promoter activity in A549 cells (Fig. 2⇑A). 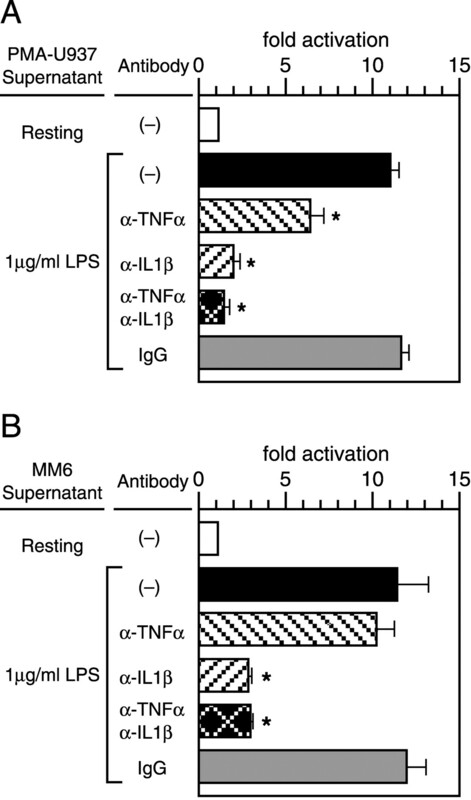 In contrast, hBD-2 promoter activity induced by MM6-derived supernatant was reduced 75% by addition of anti-IL-1β mAb, but not significantly decreased by anti-TNF-α mAb (p > 0.1) (Fig. 2⇑B). Addition of control IgG to the monocytic cell-derived supernatants did not affect hBD-2 promoter activity (p > 0.1) (Fig. 2⇑). These results suggest that IL-1β and TNF-α secreted from monocytic cells are involved in the activation of hBD-2 promoter in A549 cells. In particular, the greater inhibitory effect of anti-IL-1β mAb indicates a more important role for IL-1β in the activation of hBD-2 promoter. Accordingly, we quantified the amounts of IL-1β and TNF-α in culture supernatants from PMA-differentiated U937 and MM6 cells by ELISA (Table I⇓). IL-1β was detected at the lower limit in the supernatants from resting cells, and significantly increased after LPS stimulation. Levels of TNF-α were also elevated in the culture supernatants from LPS-stimulated cells. Interestingly, TNF-α level was 10-fold higher than that of IL-1β in the supernatant from PMA-differentiated U937 cells, whereas levels were almost equivalent in MM6-derived supernatant. Interestingly, it has been reported that TNF-α induces the production of IL-1 from human keratinocytes and colonic epithelial cells (49, 50). Thus, we tested the possibility that TNF-α might elicit the production of IL-1β from A549 cells. As shown in Table I⇓, 2–20 ng/ml TNF-α failed to stimulate A549 cells to produce detectable amounts of IL-1β. Furthermore, we confirmed that LPS stimulation did not induce the production of IL-1β and TNF-α from A549 cell (Table I⇓). These findings (Fig. 2⇑ and Table I⇑) suggest that monocytic cell-derived IL-1β is likely to have more potent activity than TNF-α in hBD-2 activation in A549 cells, although IL-1β is less released than TNF-α, especially from U937 cells. Therefore, we evaluated the response of hBD-2 promoter in A549 cells to IL-1β and TNF-α stimulation using recombinant proteins. As expected, both IL-1β and TNF-α substantially elevated hBD-2 promoter activity (Fig. 4⇓A). Of note, IL-1β was more potent than TNF-α in the activation of hBD-2 promoter even at the concentrations (0.2 ng/ml IL-1β and 2 ng/ml TNF-α, respectively) present in the culture supernatants from LPS-stimulated monocytic cells (Table I⇑). Furthermore, we observed that 20 ng/ml IL-6, another proinflammatory cytokine produced from activated monocytes/macrophages, failed to enhance hBD-2 promoter activity in A549 cells (p > 0.1) (Fig. 4⇓A). Similarly, we confirmed that the endogenous hBD-2 mRNA was strongly induced by 0.2 ng/ml IL-1β and moderately by 10 ng/ml TNF-α, but not by 20 ng/ml IL-6 in A549 cells (Fig. 4⇓B). Taken together, these results suggest that, among monocytic cell-derived cytokines, IL-1β is likely to act as a principal modulator of hBD-2 transcription in A549 cells. hBD-2 response to recombinant cytokines in A549 cells. A, A549 cells transfected with the hBD 2/Luc plasmid were incubated in the absence or presence of human recombinant cytokines (TNF-α, IL-1β, and IL-6). Luciferase activities are expressed as fold activation relative to the unstimulated control (Resting). Values are mean ± SD of four independent experiments. Values were compared between control (Resting) and cytokine-stimulated cells. ∗, p < 0.0001; ∗∗, p < 0.01. B, Expression of endogenous hBD-2 mRNA in A549 cells in response to cytokines. Confluent cells were incubated with or without TNF-α, IL-1β, or IL-6 for 16 h, and subjected to isolation of total RNA. The expression of hBD-2 mRNA was analyzed by RT-PCR. IL-1β and TNF-α initiate NF-κB signaling and induce the transcription of several genes involved in innate immune responses (4, 51, 52). In addition, these cytokines are reported to activate a transcription factor, AP-1, by mediating the p38 mitogen-activated protein (MAP) kinase and stress-activated protein kinase/c-Jun N-terminal kinase (JNK) signaling pathways (4, 52). As shown in Fig. 5⇓A and Table II⇓, the hBD-2 promoter contains three NF-κB binding motifs, a single distal site at −2193 to −2182 (dκB) and two proximal sites at −596 to −572 and −205 to −186 (pκB2 and pκB1, respectively), as well as several putative binding sequences for AP-1, NF-IL-6, and STATs (36). Deletion and mutation analyses of the hBD-2 promoter. A, Schematic representation of the hBD-2 promoter depicting putative cis-elements: black boxes, NF-κB sites; gray boxes, STAT sites; gray ovals, NF-IL-6 sites; open oval, AP-1 family site; and open boxes, TATA and CCAAT boxes. Hatched box shows exon 1 of hBD-2 gene. The transcription start site is numbered +1. NF-κB binding sites are termed dκB (position −2193/−2182), pκB2 (−596/−572), and pκB1 (−205/−186). 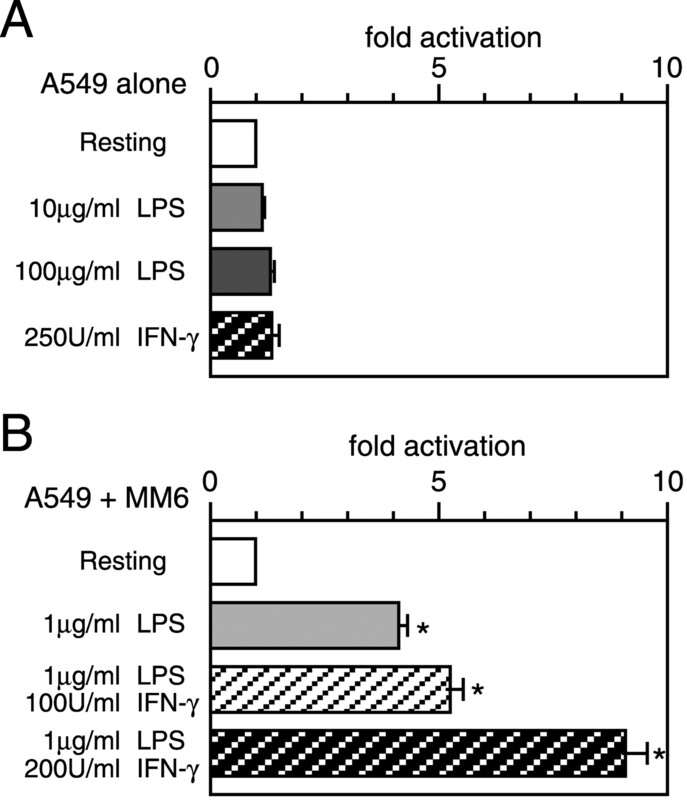 B, A549 cells were transfected with wild-type (hBD 2/Luc) or a series of 5′ truncated promoter constructs, and incubated with or without 10 ng/ml TNF-α or 1 ng/ml IL-1β for 5 h. Luciferase activities are expressed as fold activation relative to unstimulated control (Resting) in each reporter construct. C, A549 cells were transfected with wild-type (hBD 2/Luc) or mutant NF-κB construct (dκBmut/Luc, pκB2mut/Luc, pκB1mut/Luc, or pκB1+2mut/Luc), and treated as described in B. Values are mean ± SD of five to eight independent experiments. Values were compared between wild-type and its derivative constructs. ∗, p < 0.0001; ∗∗, p < 0.001. To substantiate the cis-elements of hBD-2 promoter responsive to IL-1β and TNF-α, we performed the reporter assay using a series of 5′ truncated promoter constructs (Fig. 5⇑B). Luciferase analysis showed that deletion of hBD-2 promoters to −412 (Δ−2187/Luc, Δ−1050/Luc, Δ−577/Luc, and Δ−412/Luc) did not essentially reduce responsiveness to both IL-1β and TNF-α (p > 0.05), although the responsiveness of Δ−2187/Luc was slightly increased to IL-1β. In contrast, further deletion of the pκB1 site (Δ−188/Luc) resulted in a complete loss of cytokine responsiveness (Fig. 5⇑B). These results suggest that the NF-κB binding site, pκB1 (−205 to −186) mainly contributes to the cytokine-induced hBD-2 transcription in A549 cells. To further elucidate the role of pκB1 site in the transcriptional regulation of hBD-2 gene, we generated four luciferase expression constructs containing mutated NF-κB promoters, termed dκBmut/Luc, pκB2mut/Luc, pκB1mut/Luc, and pκB1+2mut/Luc (Table II⇑). Consistent with the results of deletion analysis, mutation of the pκB1 site from −205 to −186, as well as double mutation of the pκB1 and pκB2 sites, completely abolished the up-regulation of promoter activity by IL-1β and TNF-α (Fig. 5⇑C). On the contrary, mutation of dκB (−2193 to −2182) and pκB2 (−596 to −572) had little effect on IL-1β- and TNF-α-induced hBD-2 promoter activation (p > 0.1). Taken together, our results clearly demonstrate that the NF-κB binding site pκB1 is essential to the response of hBD-2 promoter to IL-1β and TNF-α, and that binding sequences for other transcription factors do not seem to be important to regulation of the hBD-2 gene. NF-κB is composed of homo- or heterodimeric subunits of the NF-κB/Rel family members, and different combinations of NF-κB subunits contribute to the cell type- and stimulant-specific transcriptional activation (51, 53). Therefore, we determined NF-κB family members bound to the pκB1 site (−205 to −186) in the hBD-2 promoter using EMSA. As shown in Fig. 6⇓, no specific DNA-protein complex was detected when the pκB1 oligonucleotide probe was incubated with nuclear extracts from unstimulated A549 cells (Rest). Similarly, no specific binding was observed using nuclear extracts from A549 cells treated with resting monocytic cell-derived supernatants (Rest U937 and Rest MM6). In contrast, a marked single band with the same mobility was detected using nuclear extracts from A549 cells incubated with IL-1β, TNF-α, or culture supernatants from LPS-stimulated U937 and MM6 cells. The specific binding competed with excess amounts of unlabeled pκB1 and NF-κB consensus oligonucleotides, but not with unrelated NF-IL-6 consensus oligonucleotide. Furthermore, the specific complex was supershifted by addition of anti-p65 Ab as well as anti-p50 Ab. Binding of NF-κB to pκB1 site in hBD-2 promoter. Top, Nuclear extracts were prepared from untreated A549 cells (Rest) or A549 cells incubated with the following stimuli: 10 ng/ml TNF-α, 1 ng/ml IL-1β, or culture supernatants from resting or 1 μg/ml LPS-stimulated monocytic cells (PMA-differentiated U937 and MM6). Nuclear extracts (4 μg) were incubated with 32P-labeled pκB1 oligonucleotide. For the competition experiment, a 25 molar excess of unlabeled competitor oligonucleotides was added to the reaction mixture: pκB1 oligo (κB1), NF-κB consensus oligonucleotide (κB), and NF-IL-6 (C/EBPβ) consensus oligonucleotide (EBP). Supershift assay was performed using 1 μg of anti-NF-κB p65 Ab (p65), anti-NF-κB p50 Ab (p50), and rabbit IgG as a negative control (IgG). Closed arrowhead (◂) indicates specific binding to the probe. Positions of supershifted complexes are denoted by open arrowheads (◃). Bottom, Sequence of pκB1 oligonucleotides used in EMSA. The sequence spans from −208 to −183 in the hBD-2 promoter. Tandemly repeated NF-κB motifs are indicated by brackets. These observations suggest that NF-κB consisting of the p65-p50 heterodimer can bind to the pκB1 site in A549 cells stimulated with cytokines. We further addressed the involvement of NF-κB in the transcriptional regulation of hBD-2 in A549 cells using NF-κB inhibitors. A549 cells were treated with different types of NF-κB inhibitors, and then stimulated with cytokines or culture supernatants. As shown in Fig. 7⇓, A and B, 20 μM MG-132, a proteasome inhibitor, remarkably inhibited IL-1β- or TNF-α-mediated activation of hBD-2 promoter. Helenalin, which specifically inhibits binding of the NF-κB p65 subunit to DNA, also substantially reduced the cytokine-induced hBD-2 promoter activity. Likewise, both inhibitors significantly inhibited the activation of hBD-2 promoter by culture supernatants from LPS-stimulated monocytic cells (Fig. 7⇓, C and D). These results suggest that theactivation of hBD-2 promoter in A549 cells by IL-1β and TNF-α produced from LPS-stimulated monocytic cells is induced through the NF-κB-dependent pathway. Effects of NF-κB inhibitors on hBD-2 promoter activation induced by cytokines and culture supernatants. A549 cells transfected with hBD 2/Luc plasmid were incubated without (Resting) or with TNF-α (A), IL-1β (B), or the monocytic cell-derived culture supernatants (PMA-U937 (C) and MM6 (D)) for 5 h. For inhibition assay, A549 cells were incubated with NF-κB inhibitors (MG-132 and helenalin) for 30 min before stimulation. Luciferase activities are expressed as fold activation relative to the unstimulated control (Resting). Values are mean ± SD of three independent experiments. Percent inhibition of promoter activation by NF-κB inhibitors is indicated. 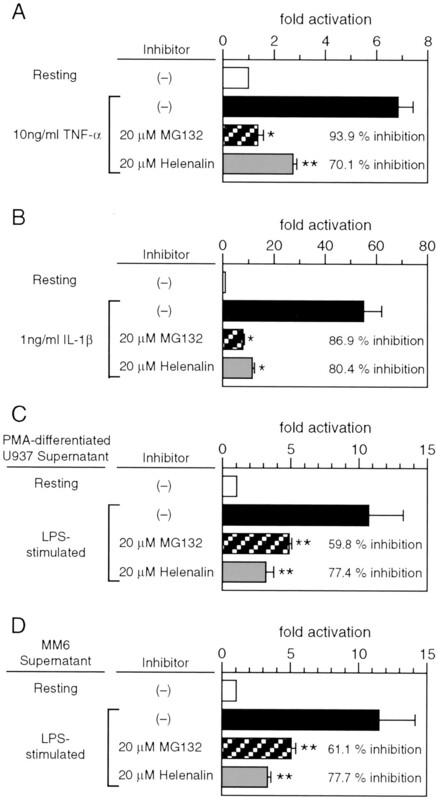 Luciferase activities of cells treated with cytokines or LPS-stimulated culture supernatants in the absence and presence of inhibitors (MG-132 and helenalin) were compared. ∗, p < 0.0001. ∗∗, p < 0.001. Increasing evidence suggests that CD14 and TLR4 play a central role in the recognition and signal transduction of LPS (26, 27, 28). Therefore, we assessed the surface expression of TLRs and CD14 on A549 cells using flow cytometry. Importantly, neither TLR4 nor TLR2 protein was detected on A549 epithelial cells (Fig. 8⇓, A and B). Intriguingly, surface expression of CD14 on A549 cells was observed using anti-CD14 mAb MY4 (Fig. 8⇓C). However, other anti-CD14 mAbs, namely 61D3 and LeuM3, hardly detected CD14 on A549 cells (data not shown). We also confirmed that CD14 molecules on MM6 cells could be detected by MY4, but not LeuM3 and 61D3 (data not shown), as previously reported (46). The expression of CD14 in A549 cells was further verified by RT-PCR analysis using DNase-treated total RNA and CD14-specific intron-spanning primers. As shown in Fig. 8⇓H, a 410-bp product of CD14 cDNA was specifically amplified from A549 cells as well as monocytic cells (MM6 and PMA-differentiated U937 cells). Moreover, we tested using flow cytometry whether LPS could bind to CD14 molecules on A549 cells. As expected, binding of LPS to A549 cells was detected using a combination of biotinylated LPS and streptavidin-PE (Fig. 8⇓D). Notably, addition of neutralizing anti-CD14 mAb (MY4), which directs a functional domain of CD14 molecules, almost completely inhibited LPS binding, whereas control mouse IgG could not. These results indicate that A549 cells express functional CD14 molecules with LPS-binding capacity. 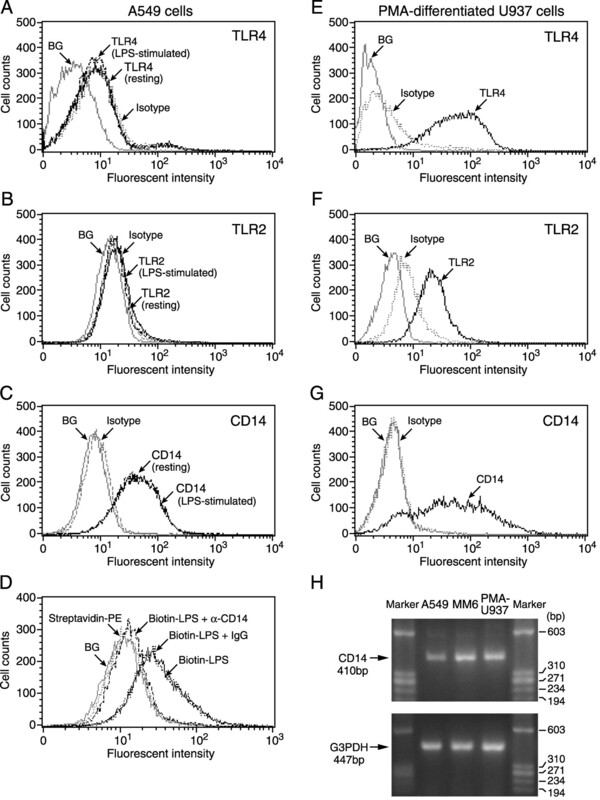 Evaluation of the expression of TLRs and CD14 on A549 and PMA-differentiated U937 cells. A549 cells were incubated with or without 10 μg/ml LPS for 16 h before harvest. U937 cells were cultured with 10 nM PMA for 2 days to induce monocytic differentiation. A549 cells and PMA-differentiated U937 cells were incubated with mAbs against TLR4 (HTA125 (A and E)), TLR2 (TLR2.1 (B and F)), and CD14 (MY4 (C and G)), or isotype controls as described in Materials and Methods. Shown are expression profiles of each receptor in A549 cells (A–C) and in PMA-differentiated U937 cells (E–G). D, LPS-binding capacity of CD14 on A549 cells. Biotin-labeled E. coli LPS was incubated with A549 cells in the presence or absence of neutralizing anti-CD14 mAb (MY4) or control mouse IgG. The binding of LPS to A549 cells was visualized by further incubation with streptavidin-PE. H, Expression of endogenous CD14 mRNA in A549 cells. Total RNA was isolated from A549 cells, MM6, and PMA-differentiated U937 cells. The size of RT-PCR product from A549 cells (410 bp) was the same as that from monocytic cells, but not from genomic DNA (498 bp; not shown). Finally, we evaluated whether LPS could modulate the expression of these PRRs on A549 cells. Following LPS stimulation, expression of TLR4 and TLR2 was still undetectable, and the expression level of CD14 did not change (Fig. 8⇑, A–C). Similar results were obtained using A549 cells treated with cytokine mixture (1 ng/ml IL-1β and 10 ng/ml TNF-α) or culture supernatants from LPS-stimulated monocytic cells (data not shown). In contrast to A549 cells, PMA-differentiated U937 cells, which are susceptible to LPS, apparently expressed CD14 and TLR4 as well as TLR2 (Fig. 8⇑, E–G). Likewise, MM6 cells expressed all the PRRs analyzed (data not shown). These results suggest that A549 epithelial cells consistently express CD14 molecules with LPS-binding capacity, but lack TLR4, a critical molecule for LPS signaling. The innate defense system plays a critical role in protecting the lungs, which are in direct contact with exogenous air, from microbial infection. Among various biological effectors, much recent attention has focused on hBD-2, an antimicrobial peptide with microbicidal activity as well as modulatory activity on adaptive immunity (1, 2, 3, 5, 6, 7, 8, 10). Because the induction of hBD-2, which is primarily expressed in epithelial cells, is controlled at the transcriptional level, the recognition and signal transduction of endogenous and exogenous stimuli via surface PRRs is crucial to hBD-2 production by epithelial cells (7). In this study, we examined the transcriptional regulation of hBD-2 in epithelial cells by mononuclear phagocytes using lung epithelia-like A549 cells and monocytic-cell lines U937 and MM6, and in particular demonstrated the role of proinflammatory cytokines produced by LPS-stimulated mononuclear phagocytes, using RT-PCR and luciferase assay. Consistent with previous reports that A549 cells were hyporesponsive to LPS (31, 32, 45), treatment of these cells with LPS (up to 100 μg/ml) alone did not induce hBD-2 promoter activation (Fig. 1⇑A). However, coculture with monocytic cells showed a significant induction of hBD-2 promoter activity in these cells following LPS stimulation (Fig. 1⇑B). Similar results were obtained using culture supernatants from LPS-stimulated monocytic cells (Fig. 2⇑). Furthermore, we confirmed that the endogenous expression of hBD-2 mRNA in A549 cells was induced following stimulation with LPS-activated monocytic cell supernatants, but not with LPS alone or unstimulated cell supernatants (Fig. 3⇑). These findings suggest that soluble factors from LPS-stimulated monocytic cells are involved in the regulation of hBD-2 gene transcription in A549 cells. Using neutralizing mAbs and recombinant cytokines and measuring cytokines in the culture supernatants, we showed in this study that IL-1β and TNF-α released from monocytic cells are responsible for the up-regulation of hBD-2 promoter activity in A549 cells (Figs. 2⇑ and 4⇑A; Table I⇑). Importantly, IL-1β showed greater potency than TNF-α in this effect, although IL-1β secretion from monocytic cells (MM6 and PMA-differentiated U937 cells) was less than that of TNF-α (Fig. 4⇑A and Table I⇑). In fact, hBD-2 promoter activity was up-regulated by IL-1β in A549 cells at a minimum concentration of 100 pg/ml, and reached a plateau at 1 ng/ml, whereas >1 ng/ml TNF-α was required to activate the promoter (data not shown). Consistent with the promoter analysis, the expression of hBD-2 mRNA in A549 cells was strongly up-regulated by 200 pg/ml IL-1β, but to a lesser extent by 10 ng/ml TNF-α (Fig. 4⇑B). 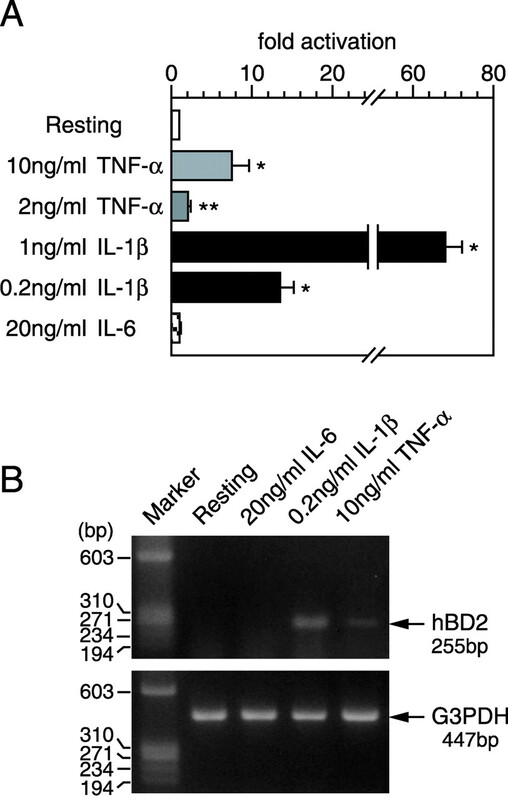 This greater contribution of IL-1β to hBD-2 transcription was further supported by the finding that anti-IL-1β mAb alone suppressed hBD-2 promoter activation by LPS-stimulated monocytic cell-derived supernatants, by 75–90%, whereas combination with anti-TNF-α mAb resulted in minimal additional decrease (Fig. 2⇑). Moreover, it was shown that two other potent cytokines, IL-6 and IFN-γ, were unlikely to be involved in the regulation of hBD-2 expression in A549 cells (Figs. 1⇑, 3⇑, and 4⇑). Taking these results together, we conclude that hBD-2 expression in A549 cells is modulated by mononuclear phagocytes through the production of IL-1β and TNF-α upon LPS stimulation. In particular, IL-1β seems to be a major activator of hBD-2 expression in these cells. It has been reported that the transcriptional activation of hBD-2 by bacteria and their products is regulated in an NF-κB-dependent manner (36, 54, 55). Both IL-1β and TNF-α induce the activation of NF-κB via the degradation of IκB, as well as that of AP-1, which is mediated via the stress-activated protein kinase/JNK and p38 MAP kinase pathways (4, 52). More recently, Krisanaprakornkit et al. (56) reported that hBD-2 transcription is mediated in gingival epithelial cells by Fusobacterium nucleatum dependent on MAP (p38 and JNK) kinase pathways but not NF-κB. These observations raise the possibility that, in addition to NF-κB, AP-1 and other transcription factors may participate in cytokine-induced hBD-2 transcription in A549 cells. However, deletional analysis of hBD-2 promoter revealed that the pκB1 site (−205 to −186) was critical for the transcriptional regulation of the hBD-2 gene by IL-1β and TNF-α in A549 cells, but none of the binding sequences for AP-1, NF-IL-6, and STATs was essential (Fig. 5⇑B). Furthermore, both IL-1β- and TNF-α-induced hBD-2 transcription was completely lost on mutation of the NF-κB site pκB1 (Fig. 5⇑C). We also noted that IL-6 and IFN-γ, which activate NF-IL-6 and STAT transcription factors, did not induce hBD-2 mRNA expression and promoter activation in A549 cells (Figs. 1⇑, 3⇑, and 4⇑). Taken together, our observations indicate that NF-κB mediates IL-1β- or TNF-α-induced hBD-2 transcription in A549 cells via binding to the pκB1 site, and that other transcription factors are unlikely to be involved in this transcriptional regulation. Furthermore, we suggested that NF-κB p65-p50 heterodimer could bind to the pκB1 site in A549 cells stimulated with either IL-1β, TNF-α, or LPS-activated monocytic cell-derived supernatants (Fig. 6⇑). The p65-p50 heterodimer is the most abundant form of the NF-κB family, and acts as a strong transactivator (53, 57, 58). In contrast, the p65 homodimer is reported to selectively bind to the NF-κB site (pκB1) in gastrointestinal cell lines exposed to Helicobacter pylori or flagella filament protein from Salmonella enteritidis (54, 55). However, in a previous study using macrophage-like RAW264.7 cells, we showed that the p65-p50 heterodimer could bind to this site on stimulation of the cells with LPS (36). Thus, the transcriptional activation of hBD-2 gene may be regulated by a combination of NF-κB subunits (p65 and p50) in a cell type-, stimulus-, or both-specific fashion. In addition, we confirmed the involvement of NF-κB in hBD-2 transcription by using two NF-κB inhibitors with different pharmacological actions. MG-132 blocks the release of NF-κB from IκB/NF-κB complex by inhibiting proteasome-mediated IκB degradation, whereas helenalin interferes with the binding of NF-κB p65 subunit to DNA (34). Both inhibitors significantly reduced the hBD-2 transcription induced by IL-1β, TNF-α, and LPS-stimulated monocytic cell-derived supernatants (Fig. 7⇑). However, these inhibitory effects were not complete. As a possible explanation for this, we speculate that one or both cytokines may mediate a second pathway leading to NF-κB activation, which is different from the signaling mediated by IκB degradation and insensitive to MG-132 and helenalin. Supporting this possibility, Bergmann et al. (59) suggest that NF-κB activation is partially regulated by phosphatidylcholine-specific phospholipase C and protein kinase C isoforms. To limit microbial infection, mammalian host cells use PRRs such as TLRs and CD14, which effectively recognize bacterial conserved molecules including LPS and peptidoglycans (26, 27, 28). Among these receptors, CD14, a GPI-anchoring receptor which lacks a cytoplasmic domain, is required for the detection and capture of LPS by interacting with a transmembrane receptor, TLR4, whereas TLR4 possesses a conserved cytoplasmic domain and acts as a signal transducer molecule to initiate the LPS signaling (27, 28, 48, 60). Actually, PMA-differentiated U937 (Fig. 8⇑, E and G) and MM6 cells (data not shown) expressed both TLR4 and CD14, and could produce IL-1β and TNF-α in response to LPS (Table I⇑). Of importance, using RT-PCR analysis and flow cytometry, we observed that A549 cells express CD14 mRNA and protein with LPS binding activity (Fig. 8⇑, C, D, and H). Furthermore, it is noteworthy that the expression of TLR4 on A549 cells could not be detected by flow cytometry, even after treatment with LPS (Fig. 8⇑A), IL-1β, or TNF-α (data not shown). Additionally, we could not observe detectable levels of TLR4 mRNA in A549 cells by RT-PCR (data not shown). Thus, the hyporesponsiveness of A549 cells to LPS is most likely due to deficient expression of TLR4. These findings agree with previous reports that intestinal epithelial cells with very low levels or lack of TLR4 expression are hyposensitive to LPS (61, 62). In contrast, Becker et al. (30) reported that TLR4 mRNA was detectable in primary tracheobronchial epithelial cells. These conflicting results on the expression of TLR4 mRNA may be due to the difference in cell types. Moreover, the surface expression of TLR2, which mainly recognizes Gram-positive bacteria-derived peptidoglycans and lipoproteins, was not detected on A549 cells (Fig. 8⇑B). Thus, our observation may complement the earlier report that A549 cells did not respond to Gram-positive group B Streptococci and their products (44, 45). Both TLR4 and IL-1R belong to the IL-1R/TLR superfamily based on the homologous cytosolic Toll/IL-1R domain, which interacts with MyD88, an adaptor molecule essential for intracellular signaling. 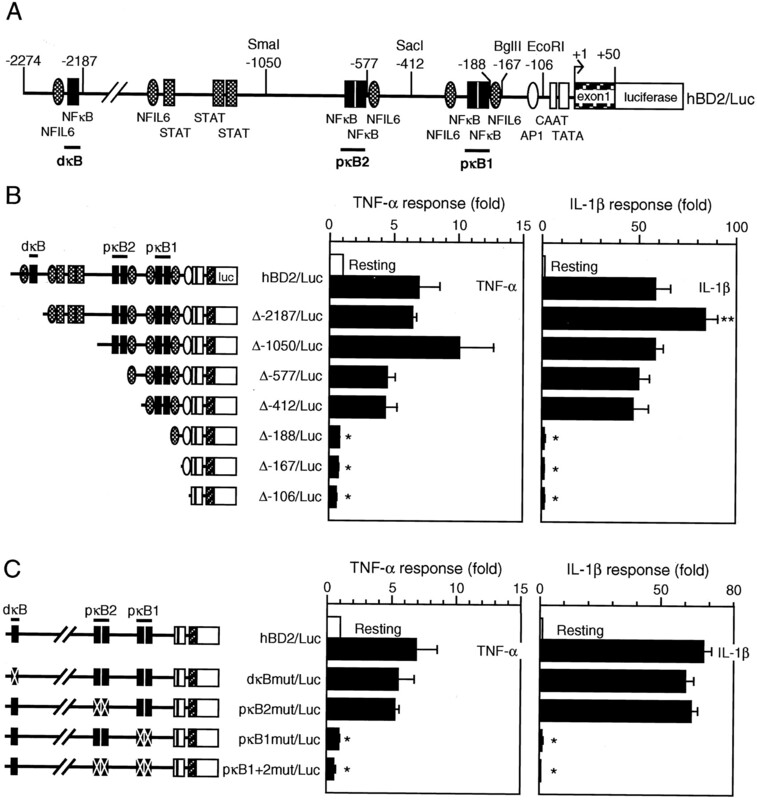 Furthermore, TLR4 and IL-1R share a common signaling pathway which activates NF-κB via the Toll/IL-1R domains (48, 60). As shown in Fig. 4⇑, A549 cells responded to IL-1β to induce hBD-2 expression, indicating that the NF-κB-dependent downstream signaling common to TLR4 and IL-1R is intact in A549 cells, despite the lack of TLR4 expression. Taking these results together, it is possible that mononuclear phagocytes in the lung expressing both CD14 and TLR4 efficiently respond to bacterial components such as LPS through the NF-κB pathway to further produce cytokines (IL-1β and TNF-α). These cytokines subsequently potentiate NF-κB-dependent signaling and trigger hBD-2 expression in pulmonary epithelial cells which express CD14 but not TLR4. Of note, LPS is able to induce desensitization of monocytes/macrophages to subsequent LPS challenge, which is known as endotoxin tolerance. Such LPS tolerance can confer cross-tolerance to TNF-α and IL-1β in addition to other bacterial products. Pretreatment of monocytic cells to LPS strongly reduces responsiveness to subsequent stimulation with TNF-α and IL-1β (63, 64). However, in A549 epithelial cells that express CD14 but not TLR4, LPS signal transduction via TLR4 cannot occur even after the binding of LPS to CD14 molecules; in other words, endotoxin tolerance cannot be induced in A549 cells. Thus, IL-1β and TNF-α could effectively evoke cellular responses in both LPS-untreated and -treated A549 cells, unlike monocytes/macrophages. In human respiratory epithelial cells, hBD-3 and -4 can also be induced by inflammatory stimuli (16, 17, 18, 19). Unlike the hBD-2 gene, their promoter regions lack the NF-κB-responsive elements, with the expression of hBD-3 mRNA up-regulated by IFN-γ, whereas the transcription of hBD-4 is induced by PMA (16, 19). Of note, hBD-2 possesses chemotactic activity for the T lymphocyte, a major IFN-γ-producing cell (23). Furthermore, the present study has revealed that hBD-2 expression in pulmonary epithelial cells is modulated by mononuclear cell-derived cytokines. Therefore, we postulate that the expression of inducible hBD-2 and -3 in pulmonary epithelial cells is controlled by interaction with monocytes/macrophages and T lymphocytes via the action of cytokines produced during infection or inflammation. Further investigation of the differential expression and actions of inducible hBDs will contribute to our understanding of their role in the pulmonary innate immune system. ↵1 This work was supported in part by a grant from the Promotion and Mutual Aid Corporation for Private Schools of Japan, the Atopy (Allergy) Research Center and High Technology Research Center (Juntendo University), and a Grant-in-Aid for Scientific Research from the Ministry of Education, Culture, Sports, Science and Technology (Japan). ↵3 Abbreviations used in this paper: hBD, human β-defensin; PRR, pattern recognition receptor; TLR, Toll-like receptor; MDMφ, monocyte-derived macrophage; MM6, Mono-Mac-6; MAP, mitogen-activated protein; JNK, c-Jun N-terminal kinase. Zhang, P., W. R. Summer, G. J. Bagby, S. Nelson. 2000. Innate immunity and pulmonary host defense. Immunol. Rev. 173:39. Diamond, G., D. Legarda, L. K. Ryan. 2000. The innate immune response of the respiratory epithelium. Immunol. Rev. 173:27. Ganz, T.. 2002. Antimicrobial polypeptides in host defense of the respiratory tract. J. Clin. Invest. 109:693. Strieter, R. M., J. A. Belperio, M. P. Keane. 2002. Cytokines in innate host defense in the lung. J. Clin. Invest. 109:699. Travis, S. M., P. K. Singh, M. J. Welsh. 2001. Antimicrobial peptides and proteins in the innate defense of the airway surface. Curr. Opin. Immunol. 13:89. Bals, R.. 2000. Epithelial antimicrobial peptides in host defense against infection. Respir. Res. 1:141. Schutte, B. C., P. B. McCray, Jr.. 2002. β-defensins in lung host defense. Annu. Rev. Physiol. 64:709. Yang, D., O. Chertov, J. J. Oppenheim. 2001. The role of mammalian antimicrobial peptides and proteins in awakening of innate host defenses and adaptive immunity. Cell. Mol. Life Sci. 58:978. Lehrer, R. I., A. K. Lichtenstein, T. Ganz. 1993. Defensins: antimicrobial and cytotoxic peptides of mammalian cells. Annu. Rev. Immunol. 11:105. Raj, P. A., A. R. Dentino. 2002. Current status of defensins and their role in innate and adaptive immunity. FEMS Microbiol. Lett. 206:9. Lehrer, R. I., T. Ganz. 2002. Defensins of vertebrate animals. Curr. Opin. Immunol. 14:96. Tang, Y. Q., J. Yuan, G. Ösapay, K./ Ösapay, D. Tran, C. J. Miller, A. J. Ouellette, M. E. Selsted. 1999. A cyclic antimicrobial peptide produced in primate leukocytes by the ligation of two truncated α-defensins. Science 286:498. Bensch, K. W., M. Raida, H. J. Magert, P. Schulz-Knappe, W. G. Forssmann. 1995. hBD-1: a novel β-defensin from human plasma. FEBS Lett. 368:331. Zhao, C., I. Wang, R. I. Lehrer. 1996. Widespread expression of β-defensin hBD-1 in human secretory glands and epithelial cells. FEBS Lett. 396:319. Harder, J., J. Bartels, E. Christophers, J. M. Schröder. 1997. A peptide antibiotic from human skin. Nature 387:861. García, J. R., F. Jaumann, S. Schulz, A. Krause, J. Rodríguez-Jiménez, U. Forssmann, K. Adermann, E. Klüver, C. Vogelmeier, D. Becker, et al 2001. Identification of a novel, multifunctional β-defensin (human β-defensin 3) with specific antimicrobial activity: its interaction with plasma membranes of Xenopus oocytes and the induction of macrophage chemoattraction. Cell Tissue Res. 306:257. Harder, J., J. Bartels, E. Christophers, J. M. Schröder. 2001. Isolation and characterization of human β-defensin-3, a novel human inducible peptide antibiotic. J. Biol. Chem. 276:5707. Jia, H. P., B. C. Schutte, A. Schudy, R. Linzmeier, J. M. Guthmiller, G. K. Johnson, B. F. Tack, J. P. Mitros, A. Rosenthal, T. Ganz, P. B. McCray, Jr.. 2001. Discovery of new human β-defensins using a genomics-based approach. Gene 263:211. García, J. R., A. Krause, S. Schulz, F. J. Rodríguez-Jiménez, E. Klüver, K. Adermann, U. Forssmann, A. Frimpong-Boateng, R. Bals, W. G. Forssmann. 2001. Human β-defensin 4: a novel inducible peptide with a specific salt-sensitive spectrum of antimicrobial activity. FASEB J. 15:1819. Duits, L. A., M. Rademaker, B. Ravensbergen, M. A. van Sterkenburg, E. van Strijen, P. S. Hiemstra, P. H. Nibbering. 2001. Inhibition of hBD-3, but not hBD-1 and hBD-2, mRNA expression by corticosteroids. Biochem. Biophys. Res. Commun. 280:522. Bals, R., X. Wang, Z. Wu, T. Freeman, V. Bafna, M. Zasloff, J. M. Wilson. 1998. Human β-defensin 2 is a salt-sensitive peptide antibiotic expressed in human lung. J. Clin. Invest. 102:874. Singh, P. K., H. P. Jia, K. Wiles, J. Hesselberth, L. Liu, B. A. Conway, E. P. Greenberg, E. V. Valore, M. J. Welsh, T. Ganz, et al 1998. Production of β-defensins by human airway epithelia. Proc. Natl. Acad. Sci. USA 95:14961. Yang, D., O. Chertov, S. N. Bykovskaia, Q. Chen, M. J. Buffo, J. Shogan, M. Anderson, J. M. Schröder, J. M. Wang, O. M. Howard, J. J. Oppenheim. 1999. β-defensins: linking innate and adaptive immunity through dendritic and T cell CCR6. Science 286:525. Niyonsaba, F., A. Someya, M. Hirata, H. Ogawa, I. Nagaoka. 2001. Evaluation of the effects of peptide antibiotics human β-defensins-1/-2 and LL-37 on histamine release and prostaglandin D2 production from mast cells. Eur. J. Immunol. 31:1066. Niyonsaba, F., K. Iwabuchi, H. Matsuda, H. Ogawa, I. Nagaoka. 2002. Epithelial cell-derived human β-defensin-2 acts as a chemotaxin for mast cells through a pertussis toxin-sensitive and phospholipase C-dependent pathway. Int. Immunol. 14:421. Alexander, C., E. T. Rietschel. 2001. Bacterial lipopolysaccharides and innate immunity. J. Endotoxin Res. 7:167. Takeda, K., S. Akira. 2001. Roles of Toll-like receptors in innate immune responses. Genes Cells 6:733. Kitchens, R. L.. 2000. Role of CD14 in cellular recognition of bacterial lipopolysaccharides. Chem. Immunol. 74:61. Guha, M., N. Mackman. 2001. LPS induction of gene expression in human monocytes. Cell. Signal. 13:85. Becker, M. N., G. Diamond, M. W. Verghese, S. H. Randell. 2000. CD14-dependent lipopolysaccharide-induced β-defensin-2 expression in human tracheobronchial epithelium. J. Biol. Chem. 275:29731. Keicho, N., W. M. Elliott, J. C. Hogg, S. Hayashi. 1997. Adenovirus E1A upregulates interleukin-8 expression induced by endotoxin in pulmonary epithelial cells. Am. J. Physiol. 272:L1046. Standiford, T. J., S. L. Kunkel, M. A. Basha, S. W. Chensue, J. P. Lynch, III, G. B. Toews, J. Westwick, R. M. Strieter. 1990. Interleukin-8 gene expression by a pulmonary epithelial cell line: a model for cytokine networks in the lung. J. Clin. Invest. 86:1945. Lyβ, G., A. Knorre, T. J. Schmidt, H. J. Pahl, I. Merfort. 1998. The anti-inflammatory sesquiterpene lactone helenalin inhibits the transcription factor NF-κB by directly targeting p65. J. Biol. Chem. 273:33508. Liu, L., L. Wang, H. P. Jia, C. Zhao, H. H. Heng, B. C. Schutte, P. B. McCray, T. Ganz. 1998. Structure and mapping of the human β-defensin HBD-2 gene and its expression at sites of inflammation. Gene 222:237. Tsutsumi-Ishii, Y., I. Nagaoka. 2002. NF-κB-mediated transcriptional regulation of human β-defensin-2 gene following lipopolysaccharide stimulation. J. Leukocyte Biol. 71:154. Plötz, S. G., A. Lentschat, H. Behrendt, W. Plötz, L. Hamann, J. Ring, E. T. Rietschel, H.-D. Flad, A. J. Ulmer. 2001. The interaction of human peripheral blood eosinophils with bacterial lipopolysaccharide is CD14 dependent. Blood 97:235. Goyert, S. M., E. M. Ferrero, S. V. Seremetis, R. J. Winchester, J. Silver, A. C. Mattison. 1986. Biochemistry and expression of myelomonocytic antigens. J. Immunol. 137:3909. Goyert, S. M., L. Cohen, C. Gangloff, R. Ashmun, N. Haeffner-Cavaillon. 1998. CD14 workshop panel report. T. Kishimoto, III, and H. Kikutani, III, and A. E. G. K. von dem Borne, III, and S. M. Goyert, III, and D. Y. Mason, III, and M. Miyasaka, III, and L. Moretta, III, and K. Okumura, III, and S. Shaw, III, and T. M. Springer, III, et al eds. Leucocyte Typing VI: White Cell Differentiation Antigens 963. Garland, New York. Blondin, C., A. le Dur, B. Cholley, M. Caroff, N. Haeffner-Cavaillon. 1998. CD14 workshop: binding of lipopolysaccharide through soluble CD14 and membrane-bound CD14 pathways triggers cellular activation via a common transducing molecule. T. Kishimoto, III, and H. Kikutani, III, and A. E. G. K. von dem Borne, III, and S. M. Goyert, III, and D. Y. Mason, III, and M. Miyasaka, III, and L. Moretta, III, and K. Okumura, III, and S. Shaw, III, and T. M. Springer, III, et al eds. Leucocyte Typing VI: White Cell Differentiation Antigens 965. Garland, New York. Dignam, J. D., R. M. Lebovitz, R. G. Roeder. 1983. Accurate transcription initiation by RNA polymerase II in a soluble extract from isolated mammalian nuclei. Nucleic Acids Res. 11:1475. Harder, J., U. Meyer-Hoffert, L. M. Teran, L. Schwichtenberg, J. Bartels, S. Maune, J. M. Schröder. 2000. Mucoid Pseudomonas aeruginosa, TNF-α, and IL-1β, but not IL-6, induce human β-defensin-2 in respiratory epithelia. Am. J. Respir. Cell Mol. Biol. 22:714. Keane, M. P., R. M. Strieter. 2002. The importance of balanced pro-inflammatory and anti-inflammatory mechanisms in diffuse lung disease. Respir. Res. 3:5. Goodrum, K. J., J. Poulson-Dunlap. 2002. Cytokine responses to group B Streptococci induce nitric oxide production in respiratory epithelial cells. Infect. Immun. 70:49. Krakauer, T.. 2002. Stimulant-dependent modulation of cytokines and chemokines by airway epithelial cells: cross talk between pulmonary epithelial and peripheral blood mononuclear cells. Clin. Diagn. Lab. Immunol. 9:126. Ziegler-Heitbrock, H. W., E. Thiel, A. Futterer, V. Herzog, A. Wirtz, G. Riethmuller. 1988. Establishment of a human cell line (Mono Mac 6) with characteristics of mature monocytes. Int. J. Cancer 41:456. Paludan, S. R.. 2000. Synergistic action of pro-inflammatory agents: cellular and molecular aspects. J. Leukocyte Biol. 67:18. O’Neill, L. A., C. A. Dinarello. 2000. The IL-1 receptor/toll-like receptor superfamily: crucial receptors for inflammation and host defense. Immunol. Today 21:206. Kang, K., C. Hammerberg, K. D. Cooper. 1996. Differential regulation of IL-1 and IL-1 receptor antagonist in HaCaT keratinocytes by tumor necrosis factor-α and transforming growth factor-β1. Exp. Dermatol. 5:218. Vallette, G., A. Jarry, P. Lemarre, J. E. Branka, C. L. Laboisse. 1997. NO-dependent and NO-independent IL-1 production by a human colonic epithelial cell line under inflammatory stress. Br. J. Pharmacol. 121:187. Hatada, E. N., D. Krappmann, C. Scheidereit. 2000. NF-κB and the innate immune response. Curr. Opin. Immunol. 12:52. Rahman, I., W. MacNee. 1998. Role of transcription factors in inflammatory lung diseases. Thorax 53:601. Ghosh, S., M. J. May, E. B. Kopp. 1998. NF-κB and Rel proteins: evolutionarily conserved mediators of immune responses. Annu. Rev. Immunol. 16:225. Ogushi, K., A. Wada, T. Niidome, N. Mori, K. Oishi, T. Nagatake, A. Takahashi, H. Asakura, S. Makino, H. Hojo, et al 2001. Salmonella enteritidis FliC (flagella filament protein) induces human β-defensin-2 mRNA production by Caco-2 cells. J. Biol. Chem. 276:30521. Wada, A., K. Ogushi, T. Kimura, H. Hojo, N. Mori, S. Suzuki, A. Kumatori, M. Se, Y. Nakahara, M. Nakamura, et al 2001. Helicobacter pylori-mediated transcriptional regulation of the human β-defensin 2 gene requires NF-κB. Cell. Microbiol. 3:115. Krisanaprakornkit, S., J. R. Kimball, B. A. Dale. 2002. Regulation of human β-defensin-2 in gingival epithelial cells: the involvement of mitogen-activated protein kinase pathways, but not the NF-κB transcription factor family. J. Immunol. 168:316. Schmitz, M. L., P. A. Baeuerle. 1991. The p65 subunit is responsible for the strong transcription activating potential of NF-κB. EMBO J. 10:3805. Naumann, M.. 2000. Nuclear factor-κB activation and innate immune response in microbial pathogen infection. Biochem. Pharmacol. 60:1109. Bergmann, M., L. Hart, M. Lindsay, P. J. Barnes, R. Newton. 1998. IκBα degradation and nuclear factor-κB DNA binding are insufficient for interleukin-1β and tumor necrosis factor-α-induced κB-dependent transcription: requirement for an additional activation pathway. J. Biol. Chem. 273:6607. Bowie, A., L. A. O’Neill. 2000. The interleukin-1 receptor/Toll-like receptor superfamily: signal generators for pro-inflammatory interleukins and microbial products. J. Leukocyte Biol. 67:508. Abreu, M. T., P. Vora, E. Faure, L. S. Thomas, E. T. Arnold, M. Arditi. 2001. Decreased expression of Toll-like receptor-4 and MD-2 correlates with intestinal epithelial cell protection against dysregulated proinflammatory gene expression in response to bacterial lipopolysaccharide. J. Immunol. 167:1609. Naik, S., E. J. Kelly, L. Meijer, S. Pettersson, I. R. Sanderson. 2001. Absence of Toll-like receptor 4 explains endotoxin hyporesponsiveness in human intestinal epithelium. J. Pediatr. Gastroenterol. Nutr. 32:449. Ferlito, M., O. G. Romanenko, S. Ashton, F. Squadrito, P. V. Halushka, J. A. Cook. 2001. Effect of cross-tolerance between endotoxin and TNF-α or IL-1β on cellular signaling and mediator production. J. Leukocyte Biol. 70:821. Medvedev, A. E., K. M. Kopydlowski, S. N. Vogel. 2000. Inhibition of lipopolysaccharide-induced signal transduction in endotoxin-tolerized mouse macrophages: dysregulation of cytokine, chemokine, and Toll-like receptor 2 and 4 gene expression. J. Immunol. 164:5564.